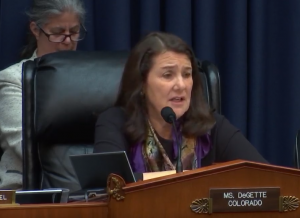 U.S. Rep. Diana DeGette chaired her first oversight hearing today to find the Trump administration guilty of stuff Obama also did. Mad with the power anointed her after Democrats took control of the House, DeGette’s first act was to brazenly dismiss God. DeGette neglected the almighty Himself when she administered the oath to witnesses to tell the truth, the whole truth, to the committee. South Carolina Republican Jeff Duncan politely reminded DeGette the oath was not administered correctly, that she, uhm, forgot something. “This is the–ah, this is the oath we use, and that’s the oath we’re going to use today,” DeGette responded. DeGette’s elimination of God in swearing oaths will obviously infuriate Christians. And it also begs the question: If the oath was not administered correctly, were the witnesses bound to the tell the truth? Can they be held in contempt if they lied to Congress? Are the witnesses immune from any Mueller indictments de jour? This was the second committee in which House Democrats dismissing God from the oaths, the other being the Judiciary Committee. So today’s question for the universe to ponder, if oaths are not based on a solemn appeal to a deity to affirm their determination to speak the truth, then what, pray tell, is the point of swearing on oath? Religion has no place in public office. Take your imaginary friend somewhere else.